Back in early January my husband and I took a trip up to New York City and spent 3 days and 2 nights at Element by Westin (hotel) which was near Times Square. If you are ever planning a trip up to New York City...we recommend that you check out that small but beautiful hotel. 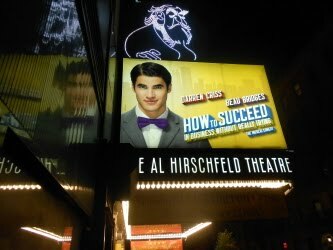 While we were up in New York City we went to see a Broadway show called "How to Succeed in Business without Really Trying" starring Darren Criss and Beau Bridges. We were able to walk the 6 blocks from our hotel to the show and it was a nice walk...but the streets where indeed packed by locals and by tourists at 7 pm that evening. The show was at the Al Hirschfeld Theatre lasted about 2 hours and 45 minutes and the theatre house was packed and sold out! This was my first time seeing a Broadway Show but it was my husbands second time. (he saw Jersey Boys back in October of 2010). This show was super funny, very entertaining and the actors were fabulous! If you ever get a chance to see this Broadway Show we highly recommend it! We had a great time!